A program created this year will help pay mental health professionals’ student loans if they practice in a medically needy area. The program seeks to alleviate the state’s shortage of mental health professionals, which watchdogs are calling a "public health emergency." Desperate to attract mental health care workers, clinics in rural and other underserved parts of Texas have gotten creative in their hiring tactics — touting benefits like fresh air and low crime rates. Soon the state of Texas will offer another incentive: cash. Lawmakers this year created a program — at a cost of nearly $3 million over the next two years — that will help pay off mental health professionals’ student loans if they practice in an underserved area. The loan forgiveness program seeks to alleviate the state’s shortage of mental health professionals — including social workers, psychologists, counselors and psychiatrists — by luring them to parts of the state that have significant need for health care but may not be attractive to graduates of expensive professional schools. Health agency officials acknowledge there is a “chronic maldistribution” of the state’s mental health workforce. Watchdogs call it a public health emergency: Of the state’s 254 counties, roughly 200 are designated as Mental Health Professional Shortage Areas. That’s a federal classification meaning there are more than 30,000 people per psychiatrist — the threshold at which it becomes nearly impossible for the average person to get a referral to a mental health specialist, experts say. Even with the loan forgiveness program in place, mental health advocates say more work is needed to attract health professionals to the neediest parts of the state. It’s a tricky policy question that boils down to people’s motivations — if the state wants more doctors and social workers to practice in parts of the state they haven’t traditionally been attracted to, advocates say state lawmakers should provide financial incentives. For one, Texas’ Medicaid program, which provides insurance for the poor and disabled, pays doctors — including psychiatrists — at low rates compared with private insurance. Doctors and advocates would like to see the state spend more on those reimbursements. And then there’s the fact that Texas leads the nation in its rate of people without health insurance — a phenomenon that’s most severe in poor counties. In underserved areas like the Rio Grande Valley, watchdog groups say there are long waiting lists to access mental health care because only a handful of psychiatrists will accept new Medicaid patients. But getting fiscal conservatives to spend more on Medicaid is a tough sell at the state Capitol, where many lawmakers say the program’s budget is already too big. Against that political backdrop, the loan forgiveness program was a big win for mental health advocates. State Sen. Charles Schwertner, a Republican from Georgetown and author of the bill that created it, noted in an statement emailed Saturday that his mother was a nurse in the mental health system for more than 25 years. "Without an adequate number of mental health professionals, we will continue to see those suffering from mental illness cycle through our jails and emergency rooms at great expense to the taxpayer," he said. The idea is that if the state spends money so that people with serious mental illness can easily access health care early on, it is cheaper and more effective than waiting for them to turn up in an emergency room or jail. 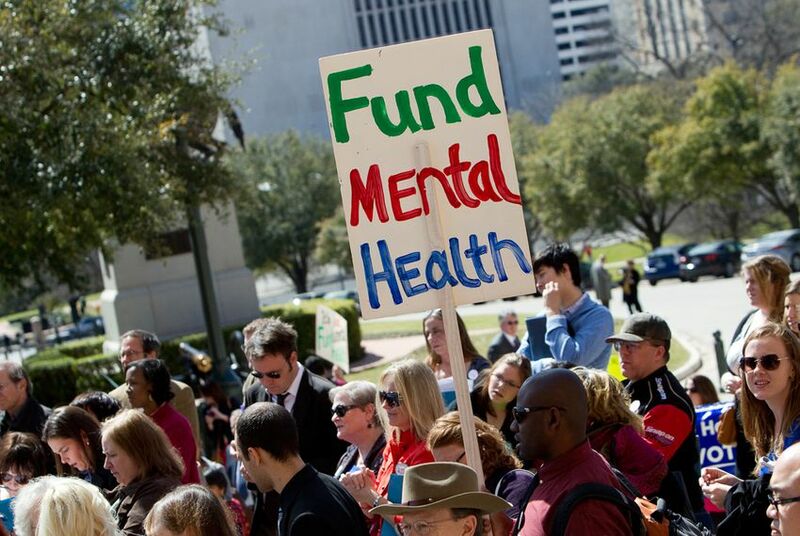 Bill Kelly, director of government affairs and public policy at the advocacy group Mental Health America of Greater Houston, said Schwertner’s bill would help Texas professional schools be more competitive in attracting students in the mental health field. Neighboring states like Louisiana and New Mexico already have loan forgiveness programs, he said. A statewide survey from April conducted by physician recruiting firm Merritt Hawkins found that 185 of Texas’ 254 counties lacked a single psychiatrist. The Texas Medical Association estimates the state would need about 1,100 more mental health doctors to bring Texas up to the national average of psychiatrists per capita. It’s an aging workforce as well. The average male psychiatrist in Texas was 57 years old in 2011, and his average female counterpart was 50, according to an analysis by the Hogg Foundation for Mental Health. Meanwhile, the state’s population is growing rapidly, expected to double by 2050. Some research suggests that the demand for mental health services is highest in areas where the supply of professionals is low. A March study published in the Journal of the American Medical Association found that the youth suicide rate in rural areas was almost twice as high as in cities. Meanwhile, the state receives federal money to help it more effectively leverage the mental health workforce it already has. More than one-fourth of the roughly 1,500 projects in a federally approved program meant to spur innovation in the health care system deal with behavioral health care, according to state health officials. That program is sending $11.4 billion to Texas over five years. Rebecca Wells, a professor with the University of Texas Health Science Center at Houston School of Public Health who has studied the mental health projects, said clinics in underserved areas that integrate mental health services with physical care often struggle to find primary care doctors who are willing to work with people with serious mental illness. Disclosure: The Meadows Mental Health Policy Institute for Texas and the Texas Medical Association are corporate sponsors of The Texas Tribune. A complete list of Tribune donors and sponsors can be viewed here.